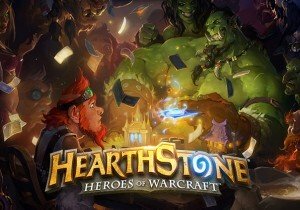 It would have been very difficult to have missed hearing about Hearthstone these past few weeks for those that check up on games on a daily basis whether it be through news or simply tuning into live streams. As of now, Hearthstone is the second most viewed game on Twitch TV. Blizzard has left it up to the community to market their game and spread the word. All the popular streamers and community members have been given invites, causing their fans to go crazy over this game. Hearthstone: Heroes of Warcraft is a casual but addictive trading card game. It features many of the traditional aspects of trading card games but offers enough new content to keep players interested and coming back for more. I have spent many hours playing this game and due to its casual play style, I can continue to play the game while carrying out other tasks. The aim of the game is simple, deplete the enemy hero’s health points to win the match. However, Hearthstone offers many different approaches when it comes to how you will deplete your enemy’s health points. You can choose to build a spell deck, taunt deck, minions deck, and so on. There is a lot of room for creativity to create your own unique play style. The game uses a hero system where aside from your played cards, your hero or player character also has abilities and may attack with weapon equips. There are currently nine different heroes to choose between each offering unique abilities such as the Mage’s ability to deal damage with a fireball or the Warlocks ability to hurt himself in order to draw a card. Nine hero choices keep the game interesting as different strategies need to be employed against certain heroes. While there may be many strategies employed by players, all the cards are very simple to understand, allowing even those that have never played a card game before to easily jump in and have fun. All cards are played using a basic mana system. Every card has a set mana cost and each turn you gain more maximum mana. You begin with 1 mana on the first turn and gain one additional crystal every turn with the end of the turn fully replenishing your mana pool. This system leads to very fast paced battles as by the time you reach 8-10 turns, players are able to play multiple cards in one go and there is little need to manage your mana pool. For this reason the matches are very short, averaging around 10 minutes for most matches. Even powerful cards can easily be killed off and countered. Hearthstone plays out with as much action as the Yugioh cartoon series, primarily because the choice to attack your opponent’s hero directly when not taunted can put pressure on them even if you’re losing. This style of gameplay also means that deck sizes are very small, allowing players to have higher chances to draw the cards they need. With only 30 cards in your deck, the luck factor has been reduced. The main issue I have with the cards in Hearthstone: Heroes of Warcraft is that despite its genre being TCG (Trading Card Game), you cannot actually trade. I personally enjoyed the trading aspect of all card games as you would work with the community to help each other build the deck of their dreams. The system to acquire cards is still being tested but I do not see it changing drastically. In the closed beta stages, players are able to purchase booster packs containing random cards with at least one guaranteed rare with either the in-game currency (gold) or real money. The pricing seems to be reasonable but due to the low cost for booster packs and the addictive nature of the game, it can be very easy to spend lots of money building your deck. To remedy the issue of allowing no trading between players, Blizzard has incorporated a crafting system. Any of your duplicate cards may be salvaged into crafting currency which can then be used to create any card. Depending on the rarity of the cards, the costs will vary. This system does allow you to discard and make use of any unwanted cards but I would still like to see a trading option. The game is still in closed beta so we might see trading options in the future but as of now Blizzard does not seem in favour of the idea of player trading. Moving on to match making, players have the option to simply play against other opponents of their level or take part in the Arena. The regular match making uses a system similar to that in place in Starcraft II. Players start out in the lower leagues (Bronze) and move up to higher leagues such as Masters based on their performance. There does not seem to be any detailed stats available to players at the moment but I would be surprised to not see more stats available after release. The Arena is a very fun and competitive way to play the game. Players must pay a fee to enter and will then be given a semi random hero and deck. You will be given options between three cards until your deck is complete. This leads to forcing players to try out new builds and play competitively to ensure their buy in money has not gone to waste. Depending on your performance, players will be awarded rewards. Arena is tons of fun but can be quite expensive to buy in. Players will earn in-game currency for every 5 wins but most of your in-game currency will be made by completing daily quests. These random quests can give simple tasks such as winning with a certain class or destroying a certain amount of minions and reward successful completion with a large sum of gold. In conclusion, I am having a blast playing Hearthstone. Even in the closed beta the gameplay is very smooth and animations are amazing. I’ve only encountered a bug once and even that was nominal. A tablet version is set to launch after release, meaning that my daily commute is about to become much more tolerable. I could easily see myself spending hours upon hours playing Hearthstone on my tablet during my commute or kicking back in bed. Unfortunately it is very difficult to get into the closed beta at the moment. Keep an eye on any websites or streamers giving out invites. As always, keep an eye on OnRPG for any news on beta invites or transition into open beta. A full review will be posted upon release of the game. This is not a game you want to miss playing!